The playlist for the February 28, 2018 broadcast of the Swing Shift Shuffle has now been added to the playlist filing cabinet. This morning's Sunrise Serenade was "Song Of India" by the Casa Loma Orchestra. Click on the song title to listen courtesy of Jazz On Line. The next Red Hot Lindy Hop event is this Saturday, March 3, at the Rumba Room. There will be a lindy hop lesson from 6-7, with open dancing from 7-9. Admission is $5 for the lesson and dance. More info here. Today's Sunrise Serenade was "The Dipsy Doodle" by Tommy Dorsey and His Orchestra with Edythe Wright on vocals. Click on the song title to listen courtesy of Jazz On Line. Baby Needs A New Pair Of Shoes! Got A Ration Book? Sarah Sundin posted this article about shoe rationing during World War II. The military needed both leather and rubber, so folks on the home front had to make things last, and that included the kids. No exceptions in shoe rationing was made for children. In 1943, everyone was limited to three pairs a year, which was reduced to two pairs in 1944, and you needed a stamp from your ration book to buy them. This morning's Sunrise Serenade was "Why Don't You Practice What You Preach" by the Boswell Sisters. Enjoy the video from YouTube. With the 2018 Winter Olympics about to conclude, I thought we would stick with that theme. No real story here, just a bunch of animals having fun with winter sports, followed by a sing along with "Jingle Bells." From the Internet Archive, here is Snow Foolin'. In the 1930's, the Works Progress Administration created the Pack Horse Library Initiative to provide reading materials to people living in poor, remote areas of Kentucky. Posted on History Daily, this article and series of photographs explains the challenges these women, who were paid by the WPA, faced while delivering their literature. Today's Sunrise Serenade was "I Fell Down And Broke My Heart In Two" by Bonnie Baker. Enjoy the video from YouTube. The playlist for the February 21, 2018 broadcast of the Swing Shift Shuffle has now been added to the playlist filing cabinet. This morning's Sunrise Serenade was "One Dozen Roses" by Glenn Miller and His Orchestra. Enjoy the video from YouTube. FilmStruck posted this review of the 1941 film, Ball of Fire, starring Gary Cooper and Barbara Stanwyck. This movie, along with its musical remake, A Song Is Born (1948), is one of my favorites, and this review has some interesting historical insight into this classic, screwball comedy. For example, when one of the gangsters holding the eccentric professors prisoner starts using items in the room for target practice, he says "I saw me a picture last week," and proceeds to wet the sight of his gun, as leading man Gary Cooper did in his previous film, Sergeant York (1941). Today's Sunrise Serenade was "You Took Advantage Of Me" by Anita O'Day. Enjoy the video from YouTube. 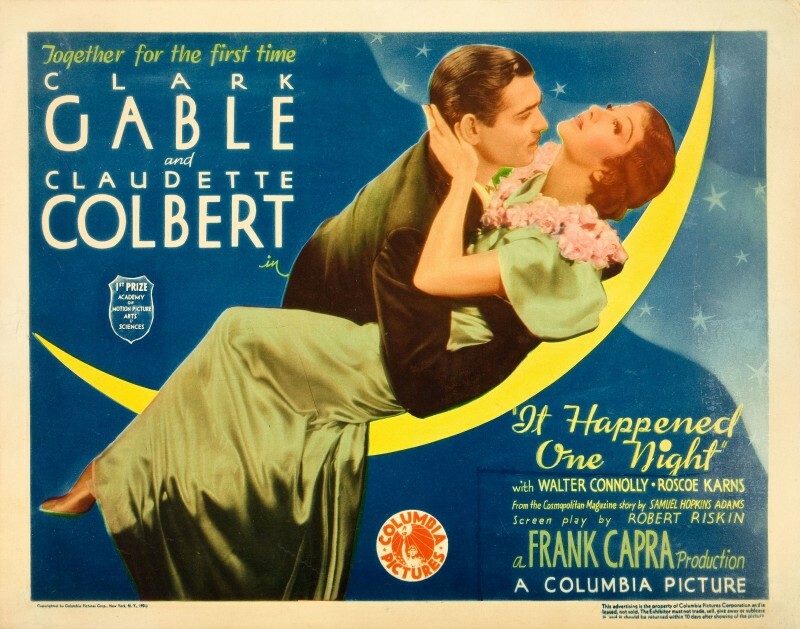 Here is a nice lobby card, posted on Vintage Ads, for the 1934 film, It Happened One Night. A fun movie, it is the story of a runaway heiress being accompanied by a (unknown to her) reporter after the story of her running away. There are some great scenes relating to intercity bus travel, complete with stops at tourist courts. The playlist for the February 14, 2018 broadcast of the Swing Shift Shuffle - The Valentine/Maletine Day Special - has now been added to the playlist filing cabinet. Happy Valentine's Day & Special Program Tonight! Happy Valentine's Day from Ms. Toby Wing, whom I found in an old Film Noir Photos post. In honor of the holiday, I'll be doing a Valentine/Malentine Special on the Swing Shift Shuffle tonight. While most of the songs will be romantic, each set will feature a "Malentine," for those who are less enamored of February 14. Hope you tune in. This morning's Sunrise Serenade was "One Meatball" by the Andrews Sisters with Bing Crosby. Enjoy the video below from YouTube. Today's Sunrise Serenade was "Breakin' The Ice" by Fats Waller and His Rhythm. Click on the song title to listen courtesy of Jazz On Line. This post on the Hemmings blog discusses the importance of accessories; specifically - period correct clothing to go with your vintage car. The post has several references to resources for those interested in vintage clothing, regardless of whether that interest relates to automobiles or not. One interesting point to me was that the desire for a "complete package" can run both ways. While many folks may become interested in vintage clothing as an accessory to their vintage car, there are some, like the couple pictured here, who acquired their vintage car as an accessory to their vintage clothes. This morning's Sunrise Serenade was "Louisiana Fairy Tale" by Fats Waller and His Rhythm. Click on the song title to listen courtesy of Jazz On Line. With the 2018 Winter Olympics now in progress, this 1945 Walt Disney animated short seemed appropriate. It reminds me of the old question: "Did you ever go to a fight and have a hockey game break out?" Posted on YouTube, here is Hockey Homicide. This morning's Sunrise Serenade was "The Rhumba Jumps" by Glenn Miller and His Orchestra with Marion Hutton and Tex Beneke on vocals. Enjoy the video from YouTube. Although the ad for this 1939 Nash, posted on Vintage Ads, makes only a slight mention of it, one of the neatest features of the pictured sedan was the bed. Introduced in 1936, the rear seat back hinged up, and in doing so opened up the trunk to the passenger compartment. Two adults could sleep with their legs and feet in the trunk, and their heads and shoulders on the rear seat cushions. I saw photos of one for sale a few years ago, and it was a cool-looking car, inside and out. Today's Sunrise Serenade was "I've Got Rings On My Fingers" by the Merry Macs. Enjoy the video from YouTube. The playlist for the February 7, 2018 broadcast of the Swing Shift Shuffle has now been added to the playlist filing cabinet. This morning's Sunrise Serenade was "Cash For Your Trash" by Fats Waller and His Rhythm. Click on the song title to listen courtesy of Jazz On Line. The Internet Archive is a massive and growing resource, and I have long since given up on the idea of exploring it all. Thus, I am always happy to find when someone else posts about an IA collection with which I was not yet familiar. Unfortunately, I have managed to completely forget where I found out about the IA's Pulp Magazine Archive, but to that now forgotten blog poster, please accept my thanks. This collection has full color scans of pulp magazines starting in the early 20th century, proceeding through the height of the pulp era in the 1930's to 1950's, and even up to the (relatively) more recent, glossy (but still pulp-like in content) magazines of the 1980's and 1990's. The cover art, especially on some of the science fiction titles, is especially cool. Today's Sunrise Serenade was "Moon Ray" by Ella Fitzgerald. Click on the song title to listen courtesy of Jazz On Line. Here is a classic Tex Avery cartoon from MGM in 1949. Hoping to avoid being the target of a hunt on the following morning, a clever rabbit keeps the hunter's dog awake all night. Found on YouTube, here is Doggone Tired. Today's Sunrise Serenade was "Moonlight Cocktail" by Glenn Miller and his Orchestra. Click on the song title to listen courtesy of Jazz On Line.